Cottonwood is English for Alamo. Pub inspired fare, Cottonwood (in Garden Oaks) is one of the best dives in the area. Part bar, part pub, part band venue, along with the best patio I've seen in a long time (fire pits, games, live music, etc. ), this is a great place for a birthday celebration. This weekend, we joined our good friend, Suzy, to celebrate her birthday. This great party was the brainchild of her loving husband (and one of my burger buddies) Scott, who chose this place not knowing it was one of my favorite bar spots, having one of the best whiskey/bourbon selections in town! But, Cottonwood also offers a great burger selection, and I've never had a burger here. Well, that is now in the past with my pure enjoyment of The Squirrel Master Burger (rated in 2013 as one of Houston Press' Top Ten Burgers)! Okay, let's set the stage, making a note that this is not the typical burger I usually order. This was a Poblano stuffed burger, with a jalapeno fried egg(! ), pepper jack cheese, and bacon. After ordering, it seemed like it took forever for my burger to arrive. Part anticipation, part hunger, and part the busy and bustling crowd. But, once it came, I snapped my photo, cut the burger in half, and took the first of many bites. The burger was perfectly cooked to order - medium. The taste was extremely good - a crisp crust on the patty with a pink center and juicy to perfection. 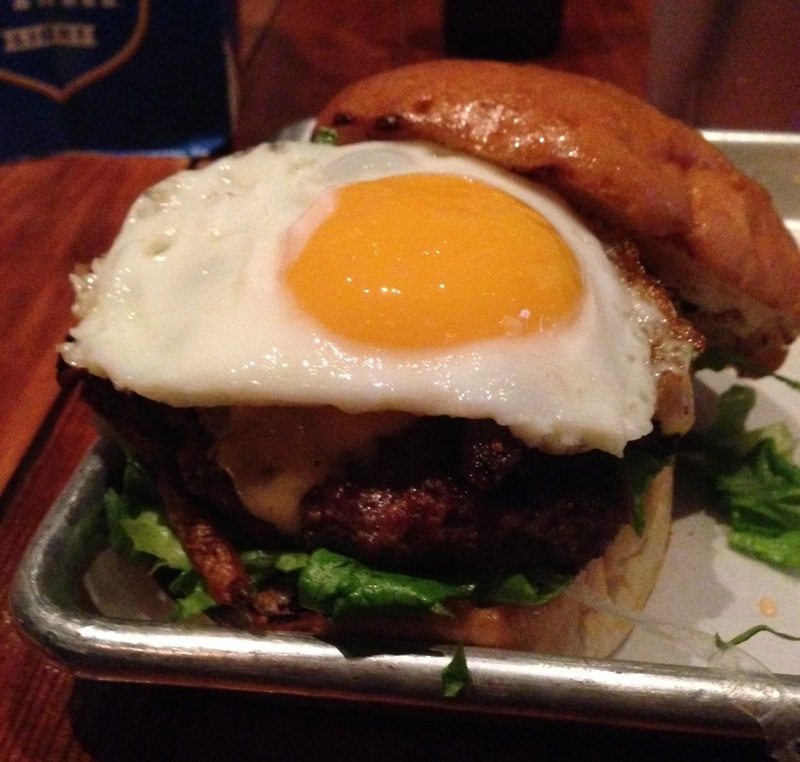 The jalapeno fried egg added a great spicy kick to the burger, but did not overpower the flavor of the meat. To me, a great burger is one where the patty is the main attraction, and this is one of those burgers. The fresh baked bun, however, was totally tasteless up against the other flavors. While I prefer a bun that does not overpower the burger, I am fond of one that offers a little flavor contrast. When I took a bite of the bun without the burger, it had a slight sweet taste, but that was lost when taking a bite of the full burger. This is not a major complaint on my part, but more of an observation. The bun is a very important part of any burger I eat, but this bun did not impact my burger experience in either a positive or negative way. For me, Cottonwood is definitely a destination. One can enjoy an awesome burger, a great whiskey, an amazing patio, and entertaining live music. I eagerly anticipate my next visit to try the other burgers on their menu. That jalapeno fried egg made this burger special, along with my Eagle Rare Manhattan! Cottonwood is English for Alamo, but should also be English for burger euphoria! Cheers to Suzy on her birthday and to Eating More Burgers!